We get bored with the same thing after a period of time because the novelty wears off. Hedonic adaptation is the term used to describe how things decrease in their ability to stimulate us over time. A strategy for a satisfied life must include being stimulated with a certain amount of novelty in order to be satisfied. Without, it the core of our sense of satisfaction begins to fade and trouble can arise out of that dissatisfaction. Some of us are not socialized in such a way that we understand and behave in ways that satisfy our hunger for stimulation constructively. We may crave novelty but not recognize how to respond constructively to that hunger. We might expect others to stimulate us and blame and be disappointed in them when they do not feed our need for stimulation. Some of us destructively attempt to satisfy it by clawing at the fabric of our social environment – perhaps causing drama or reacting to drama. (which is basically the tic and tock of the same drama clock) Still others of us may risk danger and or lifestyle stability just because we’re bored and don’t recognize how to feed our innate need for stimulation. We can also get caught in a destructive spiral of demands for increasing need for stimulation. Addiction is one form of an over stimulation spiral where an increasing spiral of hunger for stimulation can hijack our capacity to function. In these cases our lives become unstable and spin out of control. If we condense too much rapid change (novelty) into our routine we eventually may be unable to satisfy our own hunger for stimulation and cause a corresponding chaos and depression. 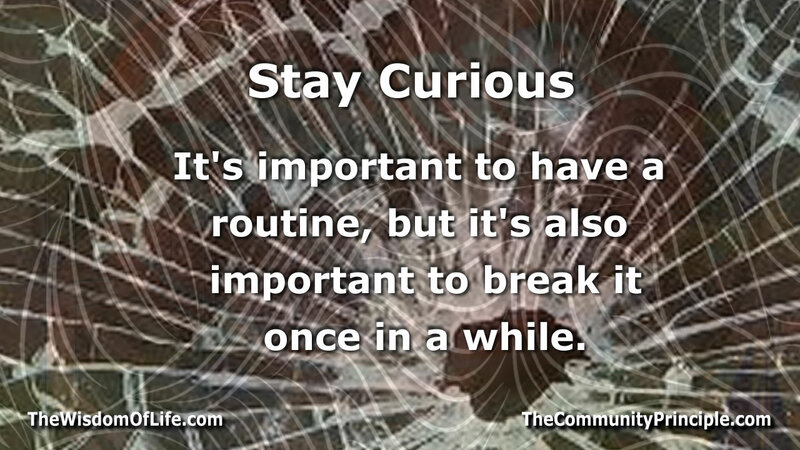 The bottom line: It’s important to have a routine, but it’s also important to break it once in a while. There are many “ifs” that contribute to determining what kind of life we’ll have. If we have physical health; – if we’re raised in a social environment that is nurturing; – if we have role models that demonstrate how to deal effectively and constructively with stress; – if we have caretakers that nurture and model nourishing social behaviors toward oneself and others; – if the native talents we have are cultivated and directed toward contributing something of nourishing value in the context of the larger community; – and if we experience a fair amount of stability in our environment; then we have a fair shot at a positive and fulfilling life. Why? Because, generally speaking, we learn how relationships work in our development environment and spend the rest of our lives echoing that relationship “language”. Our brain is a social organ that tunes our local biological functions to deal with the particulars of the environment it perceives it’s going to exist in. Our body builds its notion of “environment” from external signals. Particularly significant are the environmental cues we receive in the womb, at birth, and in the early formative years of life and later in adolescence. Not all of us get dealt a hand that inclines us to a high probability for success. The perfect developmental environment is rare. The fact is, some of us are reared in an atmosphere laced with trauma and part of our developmental equipment is a biological profile that is inclined to have a well developed response to trauma. Fear is the primary response and the “fight or flight” behaviors that flow from fear shape our experience of life. Situational trauma stems from circumstances beyond control that either erode or explosively destroy the expectation of stability and/or manageable circumstances in life. Situational trauma can be acute or chronic in nature. Acute examples are things like a random shooting, a car accident, a house fire or a sudden death. Chronic situations can be a protracted health decline, a livelihood in jeopardy or other long term stressors. Once trauma depletes or destroys of our sense of security, our body learns to replace the calm confidence we need to cultivate nourishing social bonds with fear. We develop defensive and protective behaviors that take many forms to compensate for the fear. Our reality becomes more reactive and stressed as a result. Our reaction to trauma can spiral into a self reinforcing prison of defensive and/or aggressive behavior cycles that trap us in a circle of stress. Sometimes situational trauma is both acute and chronic like an accident with long term consequences. It can also be any number of life circumstances which influence our biology to divert large amounts of energy to protection and defense. In other words, our lives can be defined by overreaction to what is actually going on in the moment so we never get to live in the moment – we never get to simply smell the roses or enjoy a sunset because we are on edge. Trauma rewires our brain on a fundamental level. This rewiring can significantly change the face of what we experience for the rest of our lives. Generational trauma is trauma of the institutional kind; it is a social tradition built of micro and macro traumas woven into the fabric of everyday social experience. Wars or severe environmental hardships can be the original source, but the response behaviors have become institutionalized as part of the culture. Because of our social nature, trauma can become a contagious way of life rooted in the social structures of families and communities. This generational and communal kind of trauma often takes the form of abuse, passive and active aggression, relational instability, destructive forms of acting out, addictions, toxic over protection, distortions of reality as a hiding place and magical thinking, hoarding, destructive enabling and relationships defined by broken promises that are embedded in the social climate. Trauma shapes our view of the world. It may be that the notion of individual property rights arose as a defense out of historic traumas such as famines and the need to hoard in order to survive harsh winters, droughts, ice ages and the like. The common thread about culturally instilled trauma is that the social environment communicates clearly that nothing is certain – that abundance and stability are illusions and nothing can be counted on unless some extreme measures are taken. A harsh edge can develop in a person or culture that suffers trauma. In our early years our brains attempt to assess and prepare us for the social landscape we will need to eek out a living. If our brain sees a climate of abuse and betrayal, it wires itself to live and function in that kind of environment. Toxic social settings of all kinds can damage and destroy the potential we have to negotiate our adult social environments in nourishing and effective ways. They can trap us beneath the threshold of our full potential. There is also a preservation effect as we project and perpetuate what we expect from reality onto our social landscape. We can become trapped in world where our vision is limited by our own prejudices. This can induce cycles of stress that not only come from external sources, but that we learn to cultivate ourselves. The plain reality is; not all of us get what we need to realize a fulfilling and satisfied life. We may know people who walk upright and seemingly function in the adult world, wielding adult responsibilities, yet possessing the emotional frailty, nearsightedness, temperament, and crude self centered social skills of children. These are the descendants of trauma: People who live and cultivate circumstances characterized by defense and aggression on a regular basis. We can be structured to unknowingly reject anything that could bring stability to our lives so that our body can be prepared for the chaos we project on our future. We might reject those capable of loving us and are instead attracted to those that will reject us. The fact that this kind of behavior often brings the chaos we fear goes unnoticed. Instead the chaos we induce is seen as proof that our fears were founded. Our reality can become increasingly reactive perpetuating the trauma. Trauma can wire us to live a life frozen in a state of stress. We may change the superficial paint job, but the emotional cycle repeats. Strings of failed relationships, addictions or destructive attachments to people and behaviors that destroy intimacy and stability become the norm. We simultaneously pass along our particular brand of reality and behavioral coping mechanisms to those unfortunate enough to come within our toxic sphere of influence. In effect; we unwittingly become the very toxin that once damaged or destroyed us. Our biology is geared to deal with fear in specific ways. One common understanding of stress behavior is called the fight or flight response. This is when we instinctively avoid or confront fearful situations. Another lesser known strategy is called the “Tend-and-Befriend” response. 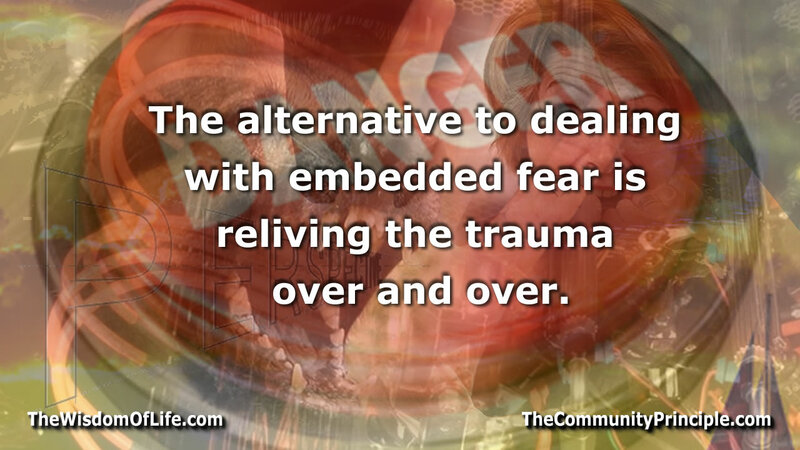 This involves responding to fear by cultivating a protective social layer. This tend and befriend response is arguably another form of defensive flight.1 In all cases, we respond by either defensive or offensive behaviors. We might also blend these strategies bouncing between fight and flight or combining the two, but the foundation of stress responses are centered on fight and flight. Trauma can lead to things like behavioral addictions and a wide variety of autoimmune diseases like arthritis, heart disease, multiple sclerosis, diabetes and so on. A host of mental disorders like PTSD, anxiety and panic disorder are also part of the realm of possibilities. Obsessive compulsive disorder (OCD) is yet another party favorite of unresolved trauma. With an uncontrollable compulsive focus on things that do not resolve, but avoid the trauma, OCD is a classic avoidance (flight) technique. Eating disorders are another common part of the behavioral repertoire of unresolved trauma. Cycles of conflict are also common to sufferers of unresolved trauma as is the practice of developing relationships based on an unhealthy demand for protection. Hoarding and becoming emotionally dependent on people or groups as protectors is sometimes seen. Conflict, avoidance or tend-befriend behaviors are a common thread that runs through the behavior and experience profile of unresolved trauma sufferers. The fight response is often expressed through a compulsion to have excessive control over others, hyper competitive personalities, narcissism, hyper-dominance, or an inordinate drive to control in any other form as a means of cultivating the illusion that we’re in control is a fight response. Fighters often attract “flighters” (tend and befriend is a form of flight). The fact that our compulsions are in control often goes unnoticed by us. Response to trauma acts as a seed that produces more traumas. The work it takes to rewire our brains to effectively deal with reality on reality’s terms is not easy. It is also not something a sane person would recommend we attempt to undertake ourselves if we have experienced life altering trauma. It is also unwise to attempt to get help from someone who shares the same pain. Unless an individual has experienced a resolution and is living a stable life, they are not fit to be healers even though they are often enlisted by trauma sufferers. The echoes of trauma are not typically something we can think our way out of. Remember; trauma rewires our brain to relive stress. Our brain becomes seasonally habituated to produce the chemicals that drive the defensive and aggressive behaviors associated with fear. Establishing the discipline to act our way out of trauma with behavioral and environmental changes is very difficult without outside help, and arguably it is also unnecessary. 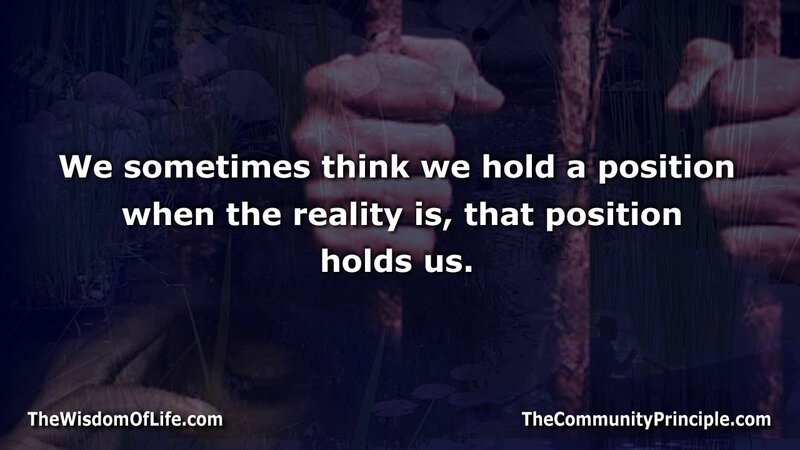 There are people well trained to guide others out of the prison trauma can lock us in. Words can help us recognize, but they cannot typically bring resolution to trauma. We are not human knowings, we are human beings, and being is what needs to be re-sculpted to bring a resolution to self defeating behavioral drives that arises out of the soil of fear. Resolution takes action. The help of an experienced guide to deal with the real situation is essential because the echoes of unresolved trauma will reverberate for a lifetime as well as spread.2 The alternative to dealing with embedded fear is to relive the trauma over and over. 2Here is some additional information on how trauma rewires our brain. Most of the work our brains do is involved in the task of shutting out distractions. It takes energy to crowd out distractions in order to focus on a narrow band of things. This exclusion process performed by the brain is the very nature of what we call focus and concentration. When we get tired, we run out of energy to keep shutting other things out so we lose focus. This loss of focus is also why most creative and inspired moments happen when we’re tired. For many of us, being tired is the only time we get to see the bigger picture. It is important to afford ourselves some time to wander the streams of consciousness.